Pakistan Telecommunication Authority (PTA) in collaboration with Ministry of Information Technology, Internet Society Asia-Pacific Bureau, Higher Education Commission of Pakistan and Special Talent Exchange Program organized the “Pakistan Digital Forum” at Islamabad. The aim of the forum was to bring together the policy maker, regulator, telecom operators, relevant stake holders, regional experts, and researchers on a common platform to deliberate on the policy and implementation strategies on Pakistan’s current and future digital landscape. 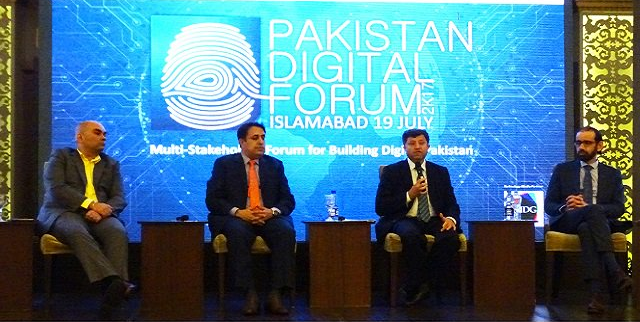 This forum featured several ICT experts with national and international speakers to discuss digital transformation and Pakistani society, digital payments for a digital economy, digital technologies and sustainable development goals and building a digital Pakistan. PTA Authority, Representatives from MOIT, Internet Society Asia-Pacific Bureau, HEC and Special Talent Exchange were are present on this occasion. The forum was divided into five sessions, where during the discussion speakers highlighted current and future IoTs marketplace in Pakistan, enabling opportunities by IoTs in industry, health, education and agriculture fields. Digital payments eco-system, e-commerce environment and Sustainable development goals for Pakistan were also focused in the forum.